This All-Clad d3 Tri-Ply stainless steel 5-quart saute pan with matching lid is perfect for large sauteed dishes with meat and vegetables. The straight sides are perfect for tossing the ingredients while you cook and it features a loop handle on the opposite side so you can better control this large pan. The stainless steel cooking surface features even, fast heating thanks to All-Clad's d3 Tri-Ply 3-layer construction. 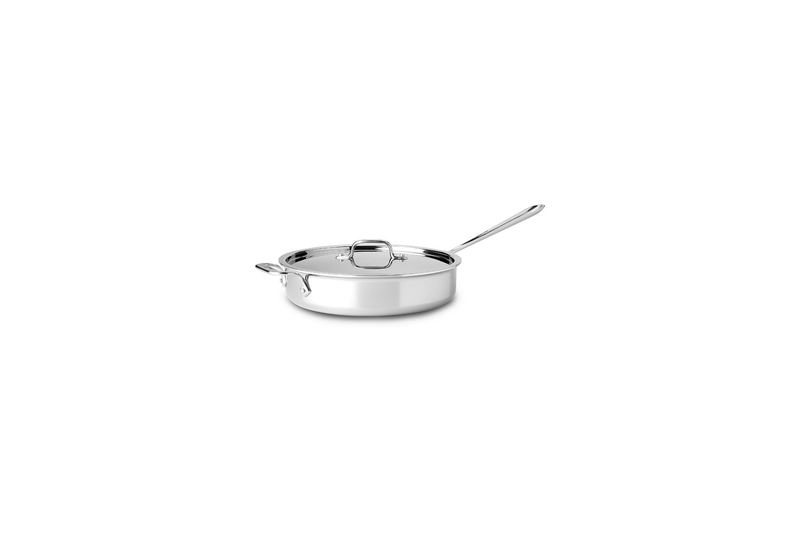 This All-Clad saute pan also comes with a lifetime warranty with normal use and proper care and is made in the USA. The large All-Clad d3 Tri-Ply stainless steel saute pan is an especially large saute pan big meals with a lot of ingredients. You'll rely on its quick and even heating, with no hot spots. The 3 layers of metal in All-Clad include a middle layer of aluminum for fast, even heating. The cooking surface is 18/10 stainless steel. This high quality metal will not react with acids or alkalies, so foods don't pick up metallic flavors. The third layer, on the outside of the cookware, is magnetic stainless steel. This durable surface makes the pan induction compatible and helps to maintain the distinctive All-Clad hand-polished finish. All-Clad fully-clad cookware is made in the USA! Foods retain their expected tastes since the 18/10 stainless steel cooking surface does not react with acids or alkalies to alter flavors. Heat is even and quick as result of a layer of heat-conducting aluminum bonded between two layers of stainless steel--All-Clad d3 Tri-Ply! Lifetime warranty from All-Clad with normal use and proper care.